Last year, I flew into the Mammoth Lakes Airport (also known as Mammoth Yosemite Airport) six different times. Five times were on business and once was for pleasure. Each business trip, I flew from LAX to Mammoth, rented a car at the airport and drove myself wherever I needed to go. On my pleasure trip, I met my family, who was already there, and we fished the Mammoth Lakes for a day and a half — and then drove home. This coming year, though, I have it all planned: I am going to fly up with my wife, Ginny, rent a car, stay at Convict Resort, eat at the Convict Lake Resort Restaurant, fish until I’m finished fishing, and then fly home. Ginny and I had one of our first dates before we were married at the Convict Lake Restaurant. Like so many people, that place is very special to us. I’m also planning a “guys only” trip where we all fly up, rent a van, have Adventures in Camping set up a couple of trailers for us somewhere in the Eastern Sierra and use them as our base camp to fish Crowley, Hot Creek, the Owens River, Mammoth Lakes, the June Loop, Convict Lake and Convict Creek. Who knows: We might even make it up to Bridgeport or get down the hill to Bishop Creek or South Lake. I imagine that trip might involve campfires, cigars and whiskey. I don’t know what the airfare is right now, but I know that last year for quite a while they had a deal where you could buy 10 one-way trips for about $600. For most of us, the gas costs more than that — especially if we are towing a boat or a travel trailer. Alaska Air and United are the carriers, and the flights have all been very good. It is always possible to get some heavy winds in that corridor that runs from Mammoth down through the Owens Valley but, so far, I have avoided the wind and all of my flights have been quick and smooth. While attending the Fred Hall Shows this year, stop by the Mammoth Lakes booth and talk to Whitney Lennon. She is the marketing manager for Mammoth Lakes Tourism, and she will know all of the details. 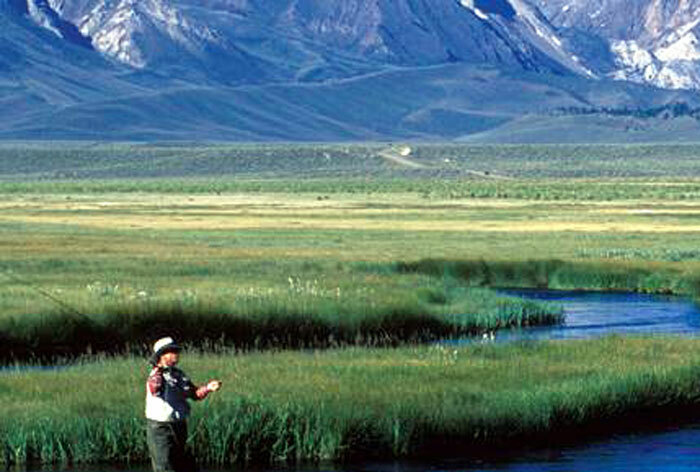 Mammoth Lakes is the sponsor of the Ultimate Eastern Sierra Experience at the Fred Hall Shows this year, and it is also the primary sponsor for the Kids Fish Free Trout Pond. The Ultimate Eastern Sierra Experience Seminar Theater will have hourly seminars and daily panel discussions on everything there is to do in the Eastern Sierra. Stop by, and find out what’s going on in our own backyard.